Please select other date or contact us at the phone numbers: (998) 193-3360 or 1-866- 393-5198 so we can help you with your reservation. Each child must come with a paying adult for this program. Aquatours is a tourist marina located in Km 6.5, alongside the Nichupte Lagoon inside the Cancun Hotel Zone. It offers the most attractive and thrilling aquatic tours across the caribbean. Cruise aboard a Spanish Galleon on our Columbus Lobster Dinner Cruise, while enjoying the beautiful sunset alongside the company of your soulmate. 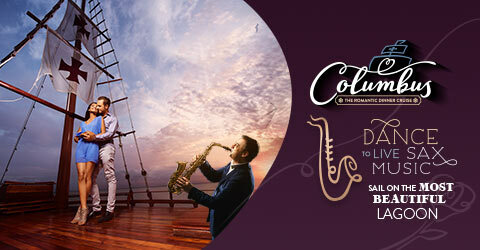 Fall in love all in the presence of a live saxophone serenade to soothe your evening and light up the spark that brought you together on this enchanting voyage. A place where love is the main dish to a dinner full of romance. 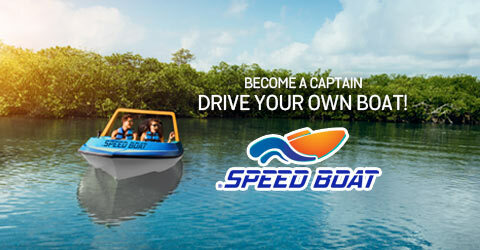 Be the captain of your own speedboat and ride away through the mangrove channels of the Nichupte Lagoon! Finish off your adrenaline filled ride at Punta Nizuc, part of the world’s second-largest coral reef. Be one of the few to visit this underground world full of mysterious species. 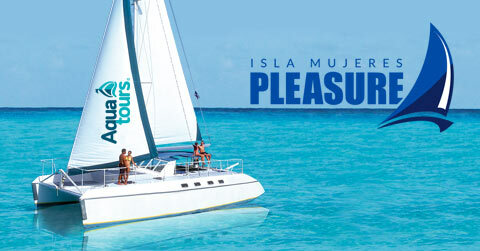 Or sail away aboard a catamaran on the Isla Mujeres Pleasure tour, an activity to enjoy with family and friends, sailing the Caribbean Sea from Cancun to Isla Mujeres, where you can snorkel in Punta Sam Reef. So if you´re up for some fun in the sun then look no further and come join us at Marina Aquatours, where you're bound to have an unforgettable vacation! Sign up and receive travel deals, articles and reviews. PLEASE READ THE FOLLOWING "TERMS AND CONDITIONS" CAREFULLY BEFORE USING THIS WEBSITE. BY USING THE SITE YOU ARE FORMALLY AGREEING TO BE BOUND UNDER ALL THE TERMS AND CONDITIONS HEREBY MENTIONED. THE OWNING COMPANY RESERVES ITS RIGHT TO UPDATE SAID TERMS AND CONDITIONS UNDER ITS OWN CRITERIA AS IT DEEMS NECESSARY. 1. General. The website belongs to Controladora Dolphin, S.A. de C.V., who reserves all rights to modify any, or every, aspect or feature contained in this website, including its contents, availability schedule and the required equipment needed for its access and use. 3. Links and Third Parties. This site may be linked to other Internet sites; these sites are not controlled by aquatours.travel, so we inform you that aquatours.travel is not responsible for any of the information contained in such websites. The existence of such links does not imply any support by aquatours.travel, or any association with its operators. In addition, aquatours.travel is not responsible for any of the websites' aforementioned privacy practices. 4. Security. Aquatours.travel is obligated to abide by every applicable privacy law and regulation regarding its users' personal information. In addition, aquatours.travel follows the industry's standards on the confidentiality of its users' personal information, including additional measures such as Secure Socket Layers ("SSL"). Aquatours.travel considers its users' personal data as an asset that must be protected from any loss or unauthorized accesses. We use several security techniques in order to provide our users a safe access against non-authorized users. 5. Conditions and Restrictions on Use. A. The user is forbidden from advertising or transmitting any material that violates the rights of others, that is illegal, threatening, abusive, libelous, invasive of the right of privacy, offensive, obscene, profane, or censurable in any other way, or which encourages illegal behavior, provokes any form of civil responsibility or may violate any law in some way. The user must not use this website to advertise or transmit any material that contains offers pertaining to products or services without the express and prior written consent on behalf of Controladora Dolphin, S.A. de C.V. The user must not employ this website to advertise any commercial offer, including any requests for other users to subscribe to other on-line information centers that compete with this website. Any action taken by a user that restricts or does not allow another user from entering or enjoying this website is strictly prohibited. B. This website contains copyright-protected material, registered brands and other commercial rights, including, and not limited to, texts, software, photographs, videos, graphic material, music and sounds. The content of this website is protected by the Mexican copyright laws. The user shall not modify, publish, transmit, show, participate in the transference or sale of, create derivative works, or exploit any, or all, of the contents in this website in any way. The user is allowed to make a single copy of the copyright-protected material contained in the website exclusively for his/her personal, non-commercial, domestic use. In exception to the material expressly allowed by copyright laws, the copying, redistributing, retransmitting, publishing or commercializing of any material downloaded from this site is prohibited, and will not be allowed without the express, written consent of Controladora Dolphin, S.A. de C.V. In case the copying, redistribution or publishing of any of the copyright-protected material, its copyright, author, commercial brands or labels must be duly mentioned, and must never be eliminated. The user acknowledges that by downloading copyright-protected material, he/she does not acquire any property right over said material. C. The user may not upload, present, or make available in any way, a brand name, copyright or property rights-protected material available in another website without the express, written consent of the brand name, copyright or property rights-protected material's owner. It is the user's exclusive responsibility to determine if said material is not copyright-protected. The user will be directly and exclusively liable for any, or all, the damages caused by a violation of copyright or property laws or for any other damage caused by such presentation. By presenting material in any of the website's areas, which are accessible to the public, the user automatically grants or guarantees that its proprietor has expressly allowed Controladora Dolphin, S.A. de C.V. the universal, perpetual, irrevocable, but not exclusive, use to reproduce, modify, adapt, publish, show, translate and distribute said material partially and totally, and may also be included in other derivative works, media and present or future technology. The user will likewise grant access to any other users to the submitted material, as well as authorization to look at, keep or copy for their personal use. The user also grants Controladora Dolphin, S.A. de C.V. the right to edit, copy, show, publish and distribute any material made available on the website. D. The aforementioned Terms and Conditions stipulated in Section 5 have been included, and must be interpreted in favor of Controladora Dolphin, S.A. de C.V., its subsidiaries, affiliates and providers of independent contents, as well as contributors; each will have the right to claim and exercise their rights in their own benefit. E. Limitation of Liability. The user explicitly accepts that the use of this website will be under his/her own risk. Neither Controladora Dolphin, S.A. de C.V. nor its affiliates, providers of independent contents or its contributors guarantee that access to the website will remain without interruptions, or that it is free of error: it also does not guarantee any obtainable results from the use of the site, or the trustworthiness of the information or services mentioned within it. The website is offered "as is" without any explicit or implicit guarantee of any kind, including, and not limited to, the title warranties, implicit commercializing guarantees or abilities for a particular purpose, except for the guarantees implied in the current and applicable laws, which are therefore not subject to exclusions, restrictions or modifications. In addition, there are no guarantees regarding the results that may be obtained through the use of this website. The user acknowledges that the dispositions set forth in this section will apply on the use and contents of this website. The applicable laws may not allow the limitations or exclusions of liability, as well as incidental or consequential damages; thereof, the aforementioned specific limitations may not apply to certain users. Under no circumstance shall Controladora Dolphin, S.A. de C.V. be held totally accountable for any damage, loss, right of action, be it under contract or as a consequence of a misdemeanor (including by his/her own negligence), or under any other legal theory (including absolute responsibility) suffered by the user in an sum exceeding the amount paid by the him/her, if there was any, to access this website. F. Monitoring. Controladora Dolphin, S.A. de C.V. reserves the right, but is not obligated to, monitor the contents of the website to determine the compliance of these Terms and Conditions, as well as any other rules of use and operation established by Controladora Dolphin, S.A. de C.V. to abide with any law or government requirement. Controladora Dolphin, S.A. de C.V. reserves its right to eliminate any material, which is considered to violate the Terms and Conditions hereby established, or that are found to be censurable in any way, according to its own absolute criteria. G. Compensation. The user commits to defend, compensate and to protect Controladora Dolphin, S.A. de C.V., its affiliates, agents, directors, officials and employees against any claim, action, lawsuit, damage, cost, responsibility, loss and expense (including reasonable legal fees) that may result from the use of this website. H. Commercial brands. The name "Controladora Dolphin, S.A. de C.V." as well as each of its logos, are commercial brands with all rights reserved. Every other commercial brand that may appear in the website is either self-owned, or has granted the appropriate licensing for its use. I. Change of Terms. Controladora Dolphin, S.A. de C.V. reserves its right to modify the Terms and Conditions applicable for the use of this website, partial or totally, at any given time, as well as to establish any additional Terms and Conditions. 6. Miscellaneous Provisions. These Terms and Conditions for the use of this website constitute an integral agreement between the involved parties in regard to the issues set forth in the present document, and replace any previous oral or written agreement on the aforementioned issues between the parties. No claim withdrawal from a violation or breach of any previous oral or written agreement stated in the present document should be considered a withdrawal from a claim on any previous or subsequent violation or breach. The titles of each section used in the present document are simply to be used as a reference, and should not be endowed with any legal effect. All Rights reserved © 2007 Controladora Dolphin, S.A. de C.V.